Liquidate or transfer all positions. Liquidate or transfer all positions to another brokerage firm. Please contact your broker for transfer instructions. Accounts with positions cannot be closed. Check positions by reviewing your account statements under Report Management section of the Account Management Menu then click Statements to verify that all positions have been liquidated. Any foreign currency you may hold to your account base currency. 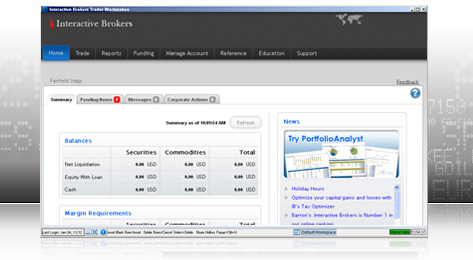 The conversion can be processed using the IDEAL/Forex system from the Trader Workstation. If you need assistance with the conversion process please contact our Trade Desk. Closing account withdrawals may only be made in the base currency. For USD based accounts IB will issue a check to your mailing address on file. Please check your mailing address under the Account Management Menu. Confirm that PTI ProDirect has your correct mailing address within the Mailing Info section located under Account Administration. Checks are automatically sent for USD based accounts. If you would like a wire transfer exit out of this area and request a Wire Transfer/ACH under our Withdrawals feature. For all non-USD based accounts. IB will issue a wire to the Banking Standing Instructions on file. Should you wish to create or change Banking Standing Instructions under Account Management Menu then click on the Withdrawals section located under Funds Management then select Wire Transfer. Then select Create Instructions to create Banking Standing Instructions or select Edit Instructions to modify your existing Banking Standing Instructions. Your market data subscriptions under Account Management Menu. Select Trading Access and then click on Market Data Subscriptions. Cash balances will be reduced by USD 150.00 until the identity token device is returned. For more information regarding the STP please contact our Technical Assistance Department. Will need to complete an IRA Withdrawal Instructions under Account Management Menu and specify the type of withdrawal for government tax reporting purposes. Such as ACH, Check and Wire Transfer deposits must adhere to the Customer Deposit Credit and Hold Periods policy before your close account request can be honored. 9. Statements and Tax forms Should be printed under Account Management Menu select Report Management, and then click on Statements and/or Tax Forms. These documents will only be available for a limited time after your account is closed. You will need to save your username and password for future access to statements. Under Account Management Menu allows you to request a closed account. Your account will be held open for 3 months after you receive your closing withdrawal to collect any possible future fees, dividends, interest, or corporate actions. After that time, your account will be closed permanently. Please check back to see if any balance has been created on future statements. Please note that if the above criteria are not met our system will not be able to process your account closure request.